I write this from a place of sitting-sweating. Labor Day has come and gone, but for those already missing summer, I have the answer: Summer Roasting. To do it my way, there are five easy steps: 1) Stop at the local farm stand (Z Food Farm) on your way home, 2) Turn your oven on to 400 degrees, 3) Turn your air conditioner off, 4) Put the chopped vegetables into the oven, and 5) Let them roast for 50 minutes while you do your own best roasting impression while preparing the rest of dinner, standing or sitting nearby. That’s how I did it today, and also once last week and the week before (except for the air conditioner part; no need to turn mine off because I don’t have one. 🙂 Yes, it’s often summer roasting time here in my kitchen). The results are worth it though, and you also can’t discount the perspiration inspiration. This time I own, as pieces roast. Got an eggplant going, for baba ghanoush. That is the state of things here, truth in rhyme. 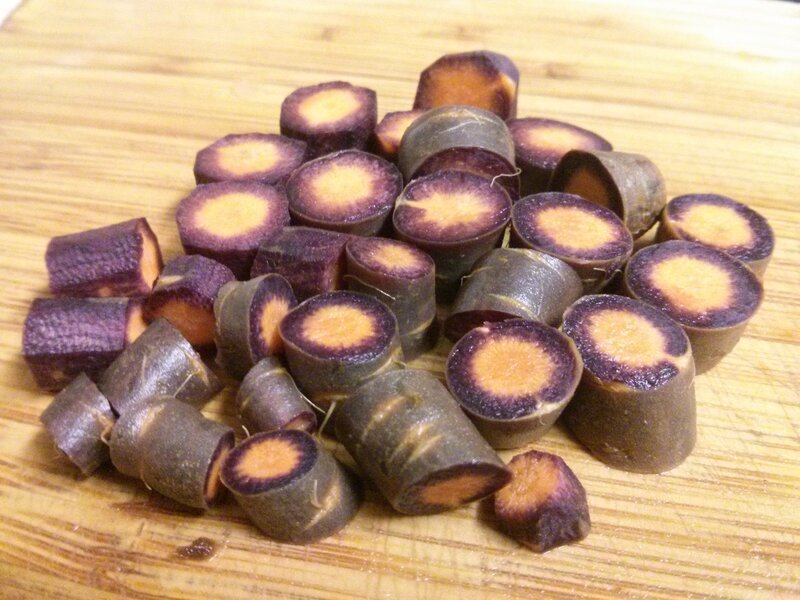 Olive oil and salt and pepper were also involved, and purple carrots too. I’ll include them here in the more traditional, full version of the recipe. Chop the other vegetables (into similar-sized pieces; I did roughly 1 cm cubes). Add the vegetables, olive oil, salt, and pepper to a baking dish. Roast at 400 degrees for about 50 minutes. The end result is nothing but sweet, roasted vegetable goodness. It’s also easy to make, and the choice of vegetables, and colors, is up to you. Later in the fall I’ll also add Brussels sprouts and butternut squash. The numbers of each vegetable is also flexible, but if you do solid threes across the cutting board, you can make it a game of culinary #threestag. This time, except for the one red pepper, I was threezing (but not freezing). Next time, I’m going try 2 Tbsp of olive oil too instead of 3 because I think that’ll be enough, or I’ll add more vegetables. And that’s summer roasting! Yes, there’s the oven. 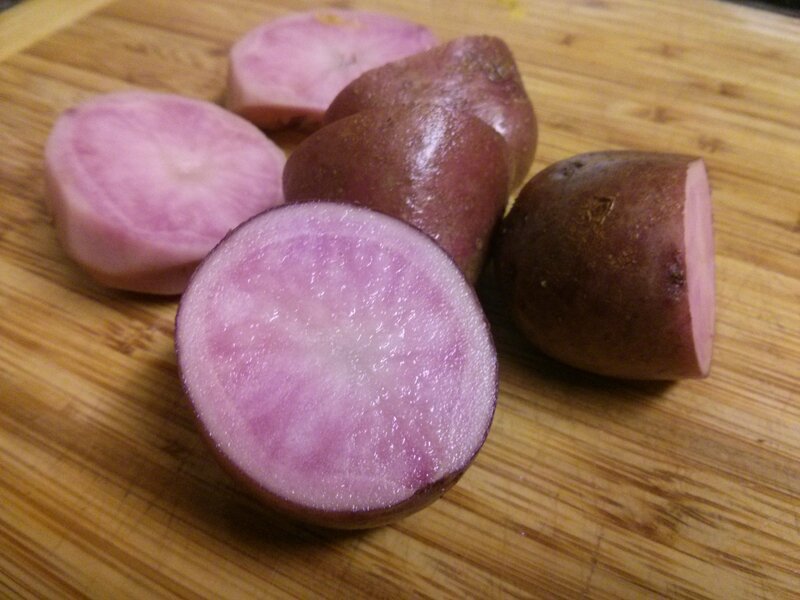 But there’s also the taste, and the colors a plenty (some shown here below, before roasting), for the overall loving. 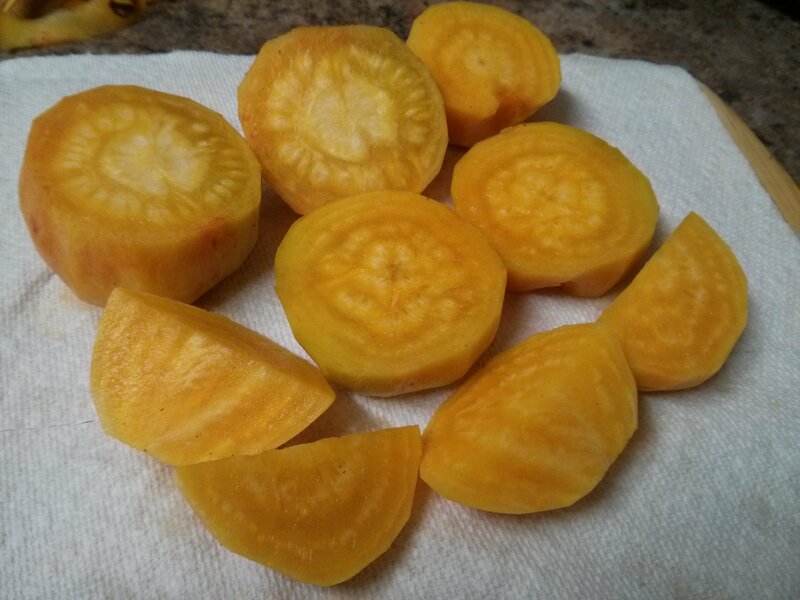 This entry was posted in Uncategorized and tagged beets, food, recipe, roasted vegetables, summer, vegan, vegetarian, verse, words on September 9, 2015 by dave379. I could also call it onion, garlic, rutabaga, tomato, salt, chili powder, cumin, and hot pepper flakes rice and beans, but that doesn’t have quite the same alliterative and exotic ring to it. Sounds like a good a good fit! Rutabaga is believed to have originally come from lands afar (Scandinavia and Russia), the idea of adding it to rice and beans is novel (intriguing! and excitingly strange! ), and unless you like your rice and beans extra crunchy, you’ll need to strip the rutabaga first along the way (that is, you’ll need to peel off its outer skin; if the Swedish turnip’s feeling bashful, feel free to give it a gentle tease). 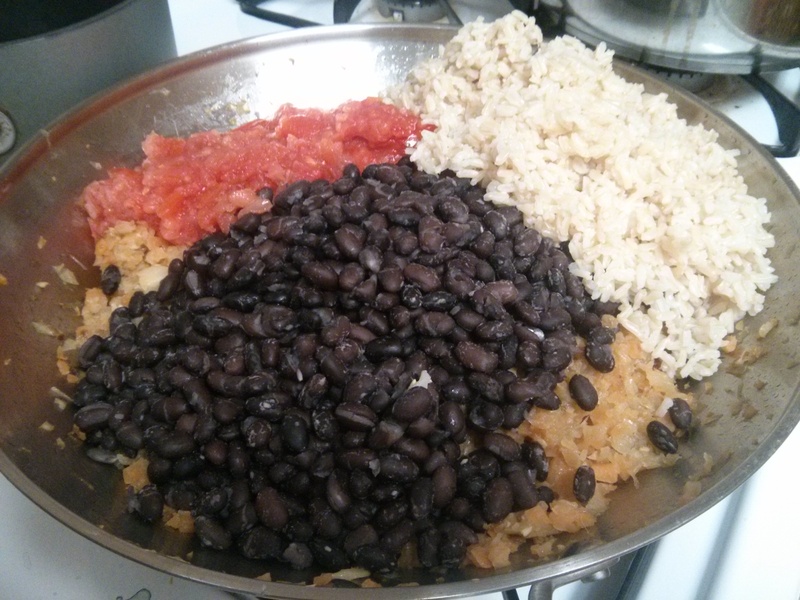 There are a lot of ways to make rice and beans. This is one. 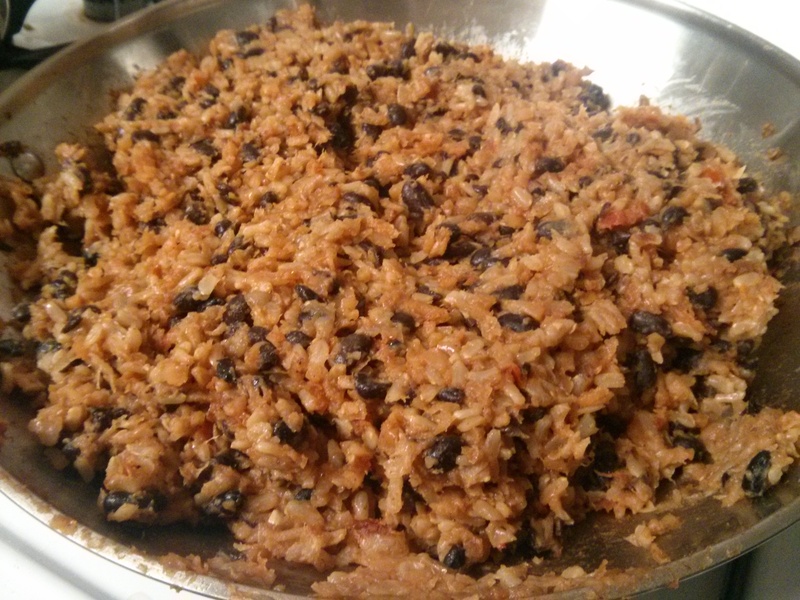 With the tomato and spices, it has somewhat of a Spanish Rice feel to it. The hot pepper flakes then add a touch of temperature, and the rutabaga and rest combine to give it a satisfying heartiness. This recipe also helps answer the question, “What should I do with all the rutabaga left over from Thanksgiving?” ‘Helps’ is the right word because, well, in my case I still have some left from the original big one. Now only a few pounds left after making this recipe. 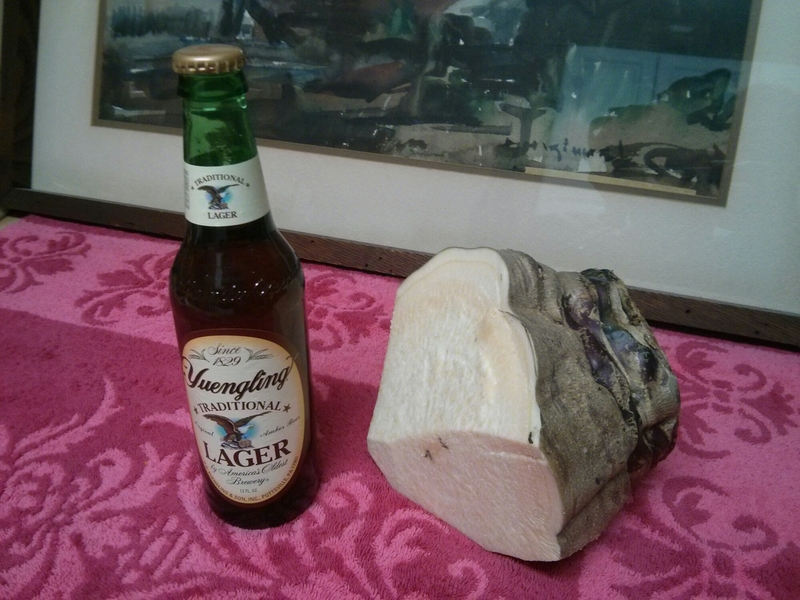 Props again to the Yuengling for the size comparison. 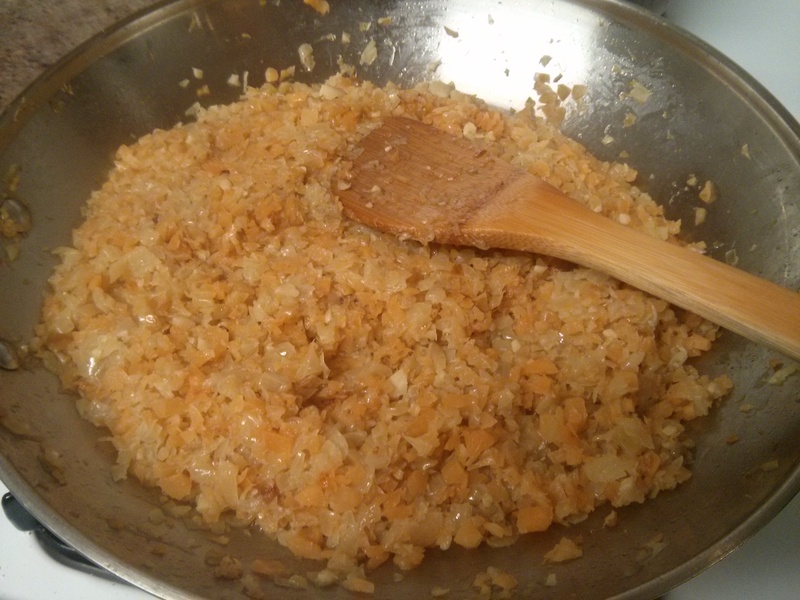 Then add the beans and rest of the ingredients to the sauteed onion/garlic/rutabaga mixture. Altogether, add: the tomatoes and crushed tomatoes, the cooked rice and the drained cooked beans, and the spices and hot pepper flakes. Cook over medium heat, stirring, until it starts to stick to the bottom (10-15 minutes). Scrape up and mix back in the parts that stick. With this dish, I like the slight crunch that comes from dried beans that have been cooked. If you want, you could also use canned beans as another option. Since the beans were cooking for an hour, I let the onions, garlic, and rutabaga sauté for the same amount of time. You could let these go for more or less time, but here’s how I did it this time. Then I put the tomatos, rice, and beans in. And then I added the spices and mixed everything together and was done! I told some friends at the potluck I made this for that it had rutabaga in it. For everyone else, surprise! But rutabaga rice and beans. What more can I say but, from another world, different, and good hot or cold. I just finished the leftovers and want some more. 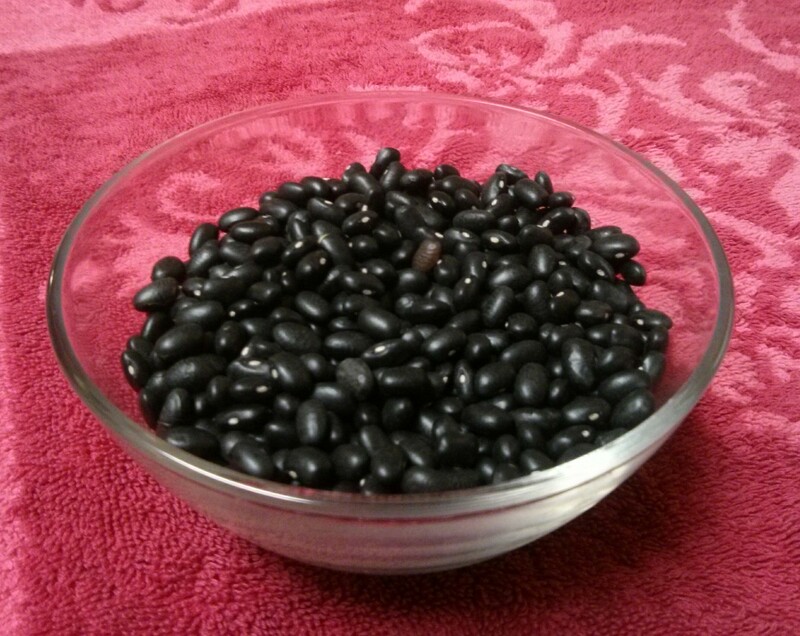 This entry was posted in Uncategorized and tagged dried beans, exotic, food, potluck, recipe, rice and beans, rutabaga, vegan, vegetarian, words on January 25, 2015 by dave379.